This is the oldest shrine in the city of Chofu. Chofu is about 8 km northeast of Shimonoseki. 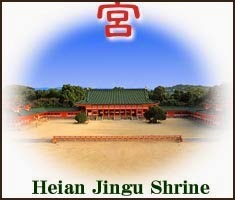 The shrine was built in 646, when the local government was set up in this region. The whole region was under the governance of the Mori family of Yamaguchi for a long time to come in the Edo period. This is the most important and remarkable festival in Chofu town. Rituals are held every night during the festival in August. The participants balance long bamboo poles of more than 20 meters with attached banners around a large stone (demon stone 鬼石 oni ishi ) in the shrine compound. Accompanying musicians with drums and gongs provide the rythm and sound, while the carriers shout "Wawassei, wawassei" ワワセイ　ワワセイ. This "Jinja" has a long history. It is said that the historic shrine was built around 200 A.D. by the legendary Empress Jingû to commemorate the death of her husband, Emperor Chûai. 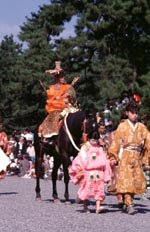 ... the matsuri also dates back to the 2nd century. The curious rite is said to imitate the victory dance after central Japan-based Yamato government's win against allied forces of south Japan-based Kumaso and then eastern Korea-based Silla, which attacked from the air, riding black cloud. The emperor Chûai played the central role in that war, legend says. People used to use pikes and fauchards, but they were replaced by bamboo at the end of 18th century by order of the feudal lord. The land of Kumaso　熊襲 today Kumamoto Prefecture.
. Kumamoto Prefecture - 熊本県 and haiku . ... a new post “New Research on the Kumaso, Hayato” in which it says the Austronesian theory of origin for Hayato and Kumaso is wrong. The poster writes that “the Yamato who were genetically linked to the Kumaso and Hayato invaded Kyushu to expand their empire”.
. Amulets and Talismans from Japan . Jidai matsuri 時代祭 (じだいまつり) "Festival of the Ages"
The central event in the festival is the Jidai Gyoretsu, a resplendent procession. In the procession, participants wear costumes representing the styles of each historical period starting with 1868 when the capital was transferred from Kyoto to Tokyo and going backward to 794 when the capital was moved to Kyoto. Led by a gallet fife and drum corps, the sumptuous and gorgeous procession comprises about 2,000 people and extends for about 2 km (1.24 miles). The spectacle also includes the charming junior geisha (maiko) and women dressed in the beautiful kimono of the imperial court. Proceeding along a 4.5km (2.8 miles) route (Miyako-Oji) from the Kyoto Imperial Garden to Heian Shrine, the parade lasts for nearly five hours. is the last division of classical Japanese history, running from 794 to 1185. The period is named after the capital city of Heian-kyō, or modern Kyōto. It is the period in Japanese history when Buddhism, Taoism and other Chinese influences were at their height. The Heian period is also considered the peak of the Japanese imperial court and noted for its art, especially poetry and literature. Although the Imperial House of Japan had power on the surface, the real power was in the hands of the Fujiwara clan, a powerful aristocratic family who had intermarried with the Emperor of Japan. Heian (平安) means "peace and tranquility" in Japanese. Buddhism began to spread throughout Japan during the Heian period, primarily through two major esoteric sects, Tendai and Shingon. 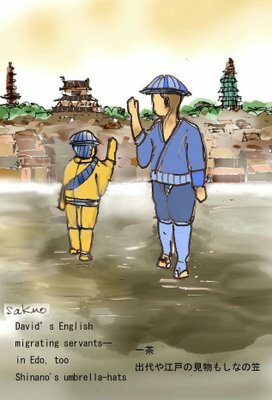 Although written Chinese (Kanbun) remained the official language of the Heian period imperial court, the introduction and wide use of kana saw a boom in Japanese literature. Despite the establishment of several new literary genres such as the novel and narrative monogatari (物語) and essays, literacy was only common among the court and Buddhist clergy. The lyrics of the modern Japanese national anthem, Kimi ga Yo, were written in the Heian period, as was The Tale of Genji by Murasaki Shikibu, one of the first novels ever written. Murasaki Shikibu's contemporary and rival Sei Shōnagon's revealing observations and musings as an attendant in the Empress' court were recorded collectively as The Pillow Book in the 990s, which revealed the quotidian capital lifestyle. The Heian period produced a flowering of poetry including works of Ariwara no Narihira, Ono no Komachi, Izumi Shikibu, Murasaki Shikibu, Saigyō and Fujiwara no Teika. The famous Japanese poem known as the Iroha (いろは), of uncertain authorship, was also written during the Heian period. Kyoto holds "Festival of the Ages"
A parade of 2,000 people wearing Japanese costumes from various historical periods was held in Kyoto on Sunday. A crowd of about 50,000 watched the procession along a 4.5-kilometer course from the Kyoto Imperial Palace to the Heian Shrine. The Jidai Matsuri is one of the city's 3 biggest festivals. 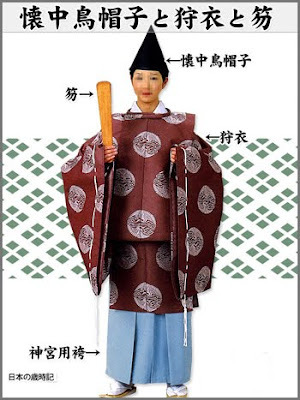 It started in 1895 when Kyoto celebrated the 1,100th anniversary of its founding in the Heian period. Sunday's parade was led by a military band dressed in the style of the Meiji era in the late 19th century. The next group represented the popular revolutionaries who helped organize the Meiji Restoration in the closing days of the Edo period, which ended in 1867. At the end of the parade were women in elaborate costumes from the Heian period. Survivors of the March 11th disaster who are living in Kyoto were invited to watch the parade. A woman said she had to evacuate her hometown in Fukushima Prefecture because of the accident at the Fukushima nuclear plant, but the beautiful parade made her feel less homesick.
. Japan after the BIG earthquake March 11, 2011　. On October 22, Heian-jingū hosts the Jidai Matsuri, which is one of the most important festivals of Kyoto. The procession of this festival begins at the old Imperial palace, and includes carrying the mikoshi (portable shrines) of Emperors Kanmu and Kōmei to the Heian-jingū. The Shrine is used for traditional Japanese weddings as well as concerts. It is popular but rare for a modern concert to be held at a historic site like the shrines, but merging modern and old culture in Kyoto has become a trend.
. Japan - Shrines and Temples .
. The Heian Period 平安時代 Heian jidai (794 - 1185) . After the New Year ceremonies, the old servants were replaced by younger ones. The old ones had to leave their employers and return to their home villages. The young ones traveled toward the nearby towns to find employment. People from the countryside went to the towns to make a bit of money during the slow seasons. degawari was often done by the oldest son or daughter of a family to learn something in Edo or a nearby town. The story of young Hideyoshi, who kept the sandals warm in his busom pocket for the lord Nobunaga and later made a career as the shoogun of Japan is quite well known. He was the leader of all the servants in a merchant home and had to take all the responsibility of a manager, doing the bookkeeping as well. 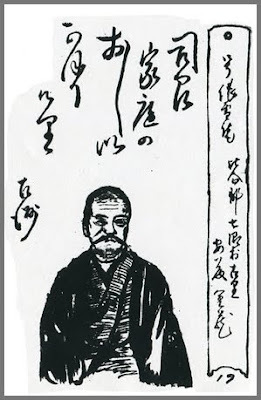 In Samurai estates, he was also called bangashira. If there were more than one bantoo in a store, one was the "Big bantoo" oobantoo 大番頭. He also worked as a leader for the neighbourhood security forces. hyakunin bantoo 百人番頭 "bantoo leading 100 servants"
ashigaru 足軽 (あしがる) "light on the feet"
They had to carry the spears, bows and arrows and other weapons. "dechi yookan, detchi yookan 丁稚ようかん (でっちようかん)" "jelly for servants"
Issa's home province was Shinano. This hokku is from Issa's own handwritten collection of his hokku that contains hokku from many years. It must be a spring hokku, since the shogunate mandated that job changes for one-year temporary workers should take place in the third month (April) and for six-month temporary workers in the third and ninth months (April, October), and only the spring and summer sections of Issa's handwritten collection remain. There were many kinds of medium-length temporary work, with the two most common being a worker in a wholesale or retail business or a low-ranking live-in household servant. The pay was very low, though living costs were covered, and in businesses there was the possibility of promotion to a semi-permanent or permanent position. Since there was a constant influx of people from poor farming areas into the city of Edo looking for work, wages stayed low, and usually those who did find work either remained for several years in order to save up a little money before they returned to their hometowns or became Edoites and settled in the big city. The man in Issa's hokku seems to be a migrant who has settled down and is now an Edo resident. For many years he's been working for one employer after another, changing either once or twice a year. He's never been able to find a permanent job, and he seems to have no special skill to sell, yet he is content to keep on changing and accepting pitiful wages the way a desperate young man would. To many people he appears shameless and thick-faced, since at sixty he should be dignified or at least above doing unskilled manual labor, but the man has learned not to be bothered by the negative opinions of others. Apparently his sixtyish face even looks a bit happy or at least relieved at finding a new job as an odd jobs man or a servant, though his nonchalance and lack of concern for social status make some people feel uneasy. The broad-rimmed rush or straw hat of the part-time worker from the country is actually a "Shinano hat," since the man is from Issa's home province. Unlike short-time visitors to Edo from Shinano and other rural areas, this part-time worker has no time to see the sights of the city, many of which are especially beautiful in the third month, when the cherries and other trees and plants are in bloom. As soon as his contract is up at one place, he must go to the temporary-job market and hustle to find a new employer. The man lives in Edo, yet he knows little more than the insides of the houses or shops in which he's lived and worked. And he can't even afford a stylish new hat of the type popular in Edo. Surely Issa marvels at the persistence and endurance (and cheerfulness?) shown by a man who continues to do this hard, demanding work past sixty, something he couldn't do himself. Luckily he discovered haikai instead. 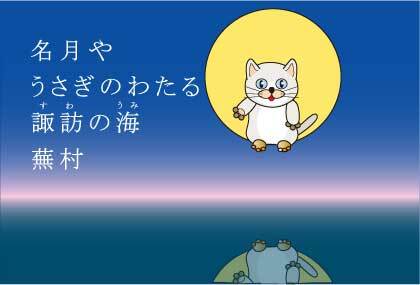 "next holiday for the servants"
It used to be the 16th day of the 7th lunar month, related to Tanabata and O-Bon. This is the biggest "fighting festival" in Japan. The night of the tenth lunar month was the full moon night of Autumn in the Asian lunar calendar. It came to be called by this name, Kenka Matsuri or 'Fighting Festival' because the mikoshi (portable shrines) are jolted against one another when carried on the shoulders of the men in the parade. There are no detailed rules or opponents for the vehement collisions of the portable shrines. As soon as the portable shrines are set properly on the men's shoulders and everyone is ready, they are knocked against one another at random, and the moment a portable shrine is hoisted on top of another, the contest is over. 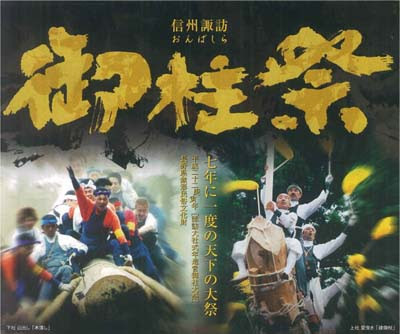 The greatest attraction is the struggle among 3 portable shrines when men over 35 wearing white headbands, those of 26-35 with yellow headbands and youths under 26 marked by red headbands, holding bamboo poles in their hands, join in the fight. A vehement struggle unfolds but this is in no way a fight between the men. This festival, which is the largest of the numerous fighting festivals held nationwide, is not only famous in Japan but is also becoming widely known overseas. The highlight of this festival is Yatai-neri, the parade of "yatai", festival floats, gorgeously decorated with wood carving, gold and silver handiwork and embroidered curtains. 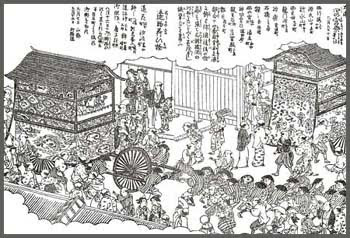 The yatai are carried on the shoulders of men and are surrounded by the men holding "shide" (bamboo poles decorated with colorful paper) in their hand. As dusk sets in, illuminations on each of the yatai are lit. There are seven districts of the town which carry their own highly decorated portable shrines (yatai 屋台) in the procession. The shrines are very heavy and are pulled and pushed on wheels. More than 3000 men take part in the various processions, and all children are proud when they are allowed to participate for the first time. A famous group of lion dancers and drums accompany the procession. The yatai come from 木場、松原、八家、妻鹿、宇佐崎、中村. The seventh village group does not participate, but carries the three large banners of the deities. The yatai rub each other (neriawase 練り合わせ). When it gets dark, each yatai is decorated with lanterns. The three portable shrines for the final fighting are much lighter and made for destruction. Every year before the festival it takes their bearers about one month to repair them, only to carry them out on the festival day to be destroyed again. The legend of the shrine tells about a fisherman from Mega, who found a plank on the shore with the inscription "Great Bosatsu Hachiman"
The origin of these fighting mikoshi, which are counted boats (maru) in this shrine, dates back to the Emperess Jingu Kogo 神功皇后 (Jinguu Koogoo), who was on a war expedition against Korea when she passed Himeji. The boats of her entourage were covered with oyster shells and she thought a quick way to remove them would be to bang and rub the boats against each other. Today's "fight" is in memory of this legend. On the evening before the main festival (yoi miya 宵宮, yoi no miya 宵の宮), all the portable shrines are paraded around town and to the main shrine. Before participating, the men have to take an ablution in the cold waters of the sea at Shirahama 白浜町. On the second day of the festival (honmiya 本宮) the portable shrines first carried around to "wipe off the dew" (tsuyu harai 露払い), together with the lion dancers and drums. Then they are carried up a steep slope in the west of the compount, to a "travel station" 御旅山 with the main Hachiman Shrine as an offering for the deities. When coming back they have to pass the Sakura Gate of the Shrine, which is so low that part of the roof decoration has to be taken down before they can pass and get the blessing of the Shinto priest. When they are back in the shrine compound, the real fight of the three boats begins, often lasting until late in the night, until all the boats are brought to fall on the ground. The men are quite exhausted from carrying the heave loads all day long, but they never give up. 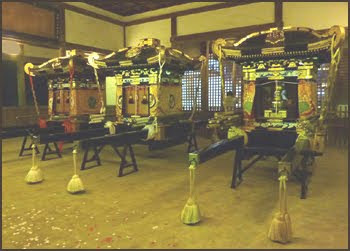 The portable shrine bearers are called "neriko 練り子. 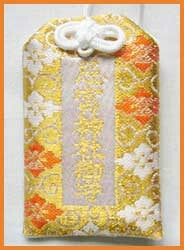 They wear a special amulet in the color of their group around their arms 腕守り, given to them by mother or wife, for protection against injuries in the heavy battles. A nearby hospital is on stand-by just in case. There have been two cases of death by being crushed in recent years. Many visitors are lined up in seats around the main "arena" in the temple ground and along the roads.
. Jingu Kogo 神功皇后 and Japanese Dolls . 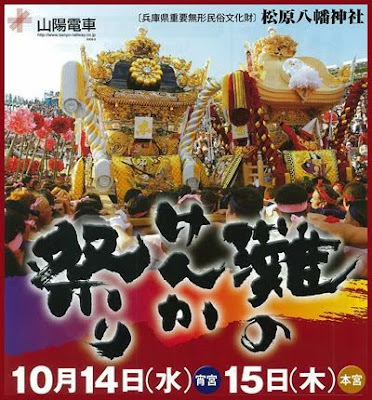 One of Shiga's major festivals featuring thirteen ornate floats displayed and paraded around central Otsu over two days before Sports Day, a national holiday around Oct. In 1596, Shiouri Jihei (塩売 治兵衛) wore a tanuki mask and danced during a Tenson Shrine festival. People liked his dancing so much that they built a float two years later and Jihei danced on it. Tapestry designated as an Important Cultural Property. The Trojan War (from Greek mythology) is depicted. On each float, there are three types of musical instruments. The gong is played by young schoolchildren, the big drum is hit by older schoolchildren and the flute is played by students and grown-ups. The mechanical devices are moved by four young boys, who crawl inside the doll and move the spear or the water, for example. 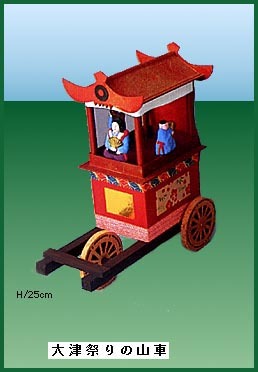 To turn such a large float in the small streets of Otsu, the float is stopped and then the front part lifted to drag it around at an angle to reach the next small street. The floats are constructed each year from the parts, it takes about one week to finish them, like a puzzle with wooden joints only. In memory of Hikaru Genji, the hero of the Tales of Genji. He is even on pudding and other food items. chimaki are a food item for good luck in the coming year, rice wrapped in gree leaves. In Otsu, even the tramway is green. They are made from strong cardbord (ボール紙), like the float toys from Nagahama. But they are not made any more.
. Shiga Prefecture Folk Art - 滋賀県 . ***** . Karakuri ningyoo からくり人形 mechanical dolls . 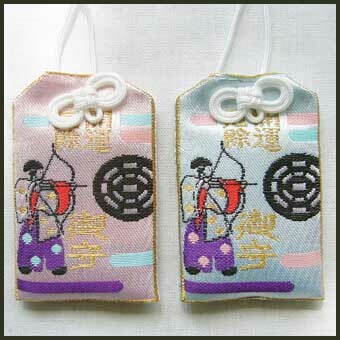 Usually from the 11 to the 13th day of the first lunar month. 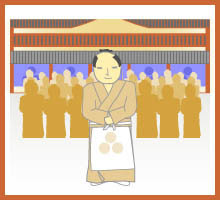 At the imperial court of the Heian period, new orders of appointment for governors to the provinces were given twice a year, at New Year (spring in the lunar calendar) and autumn. The Minister of the Left (Sadaijin 左大臣) was responsible for these appointment ceremonies. It was quite an honor for an official to be appointed governor of a province, even if it was far away from the capital of Kyoto. It is believed that the three rays from the sun ,the moon and a star are to be seen at the same time from the former Misayama Shrine (旧御射山社). Suwa taisha (諏訪大社), or Suwa Grand Shrine, is a Shinto shrine in Nagano prefecture, Japan. Over 1200 years old, it is one of the oldest shrines in existence, and is mentioned in the Kojiki, an 8th century text. It consists of four building complexes, the Maemiya (前宮, lit. old shrine), the Honmiya (本宮, main shrine), the Harumiya (春宮, spring shrine), and the Akimiya (秋宮, autumn shrine). onbashira matsuri 御柱祭（おんばしらまつり）"Suwa Pillar Festival"
Onbashira (御柱祭) is a festival held every six years in the Lake Suwa area of Nagano, Japan. The purpose of the festival is to symbolically renew the Suwa Taisha or Suwa Grand Shrine. 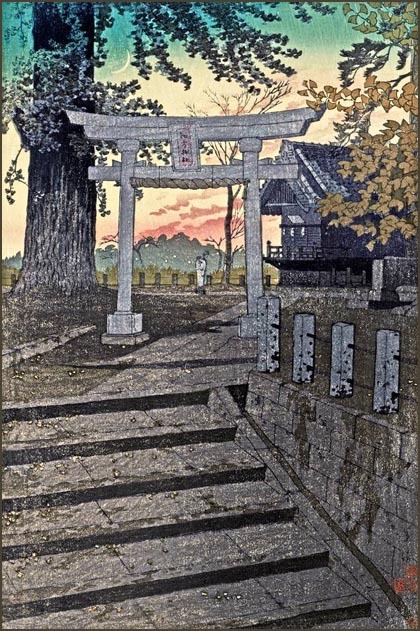 "Onbashira" can be literally translated as "the honored pillars". 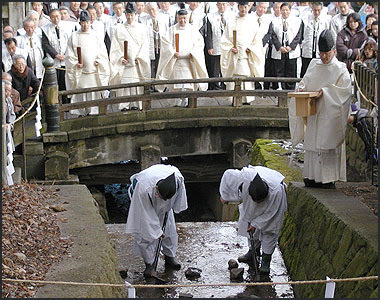 The Onbashira festival is reputed to have continued, uninterrupted, for 1200 years. The festival is held once every six years, in the years of the Monkey and the Tiger in the Chinese Zodiac, however the locals may say "once in seven years," because of the traditional Japanese custom of including the current year when counting a length of time. Onbashira lasts several months, and consists of two segments, Yamadashi and Satobiki. and Satobiki takes place in May. "Yamadashi" literally means "coming out of the mountains." 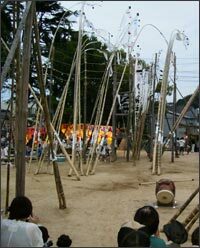 Before this portion of the festival, huge trees are cut down in a Shinto ceremony using axes and adzes specially manufactured for this single use. The logs are decorated in red and white regalia, the traditional colors of Shinto ceremonies, and ropes are attached. During Yamadashi, Teams of men drag the logs down the mountain towards the four shrines of Suwa Taisha. The course of the logs goes over rough terrain, and at certain points the logs must be skidded or dropped down steep slopes. Young men prove their bravery by riding the logs down the hill in a ceremony known as "Ki-otoshi." "Satobiki" festival involves the symbolic placement of the new logs to support the foundation of the shrine buildings. The logs are raised by hand, with a ceremonial group of log bearers who ride the log as it is being raised and sing from the top of the log to announce the successful raising. This ceremony was performed as part of the opening ceremonies of the Nagano Olympics in 1998. After two festivals, there is an important event "Building of Hoden". This event isn't generally famous, and few people know that the event is held even among people who live nearby and participate in Yamadashi and Satobiki. The end of this event marks the end of Onbashira. The origin of this festival goes back to ancient times. In the forest region of Suwa lived the Jomon people, off the woods with wild animals and plants gathered for food, praying to a deity of hunting and gathering. Then came the Yayoi folks from the continent, bringing the rice cultivation and field management and a deity of agriculture. The two clashed at Suwa but then the stronger Yayoi appeased the deity of the Jomon and venerated it in the pillars around their shrines. 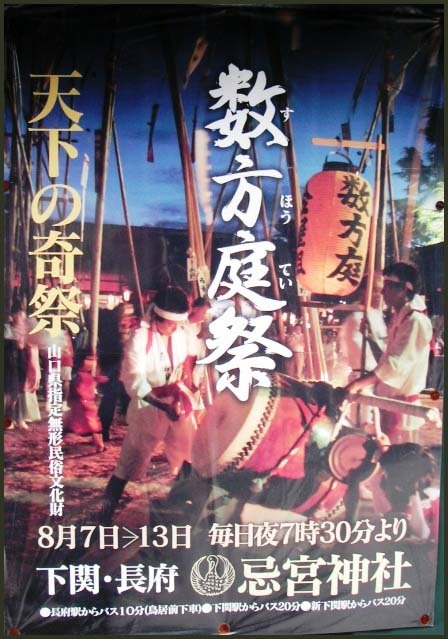 hoya 穂屋（ほや）"hut with a thatched wall"
hoya matsuri 穂屋祭（ほやまつり） Festival of the thatched hut"
now on August 27 - 28. Shrine Misayama Jinja 御射山神社 and the "Lower Shrine 下社" of Suwa. The mountain was the hunting ground of the Suwa area. Misayama, lit. 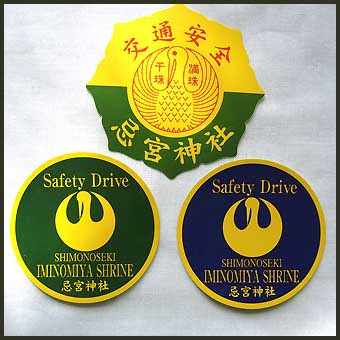 "Honorable Mountain for Shooting". A hut with thatched walls from pampas grass was erected for the shrine priest and young men of the village to stay over night. They had to participate in various purifying rituals, Then they had to perform hunting acrobatics like shooting from horseback 遠笠懸 and falconry. Now there are also shooting performances. On the morning of January 1, three or four frogs hibernation along the river bank of the river Mitarashigawa 御手洗川 are dug up and shot at with a small ritual bow and arrow made from willow wood. This helps to predict the harvest of the coming year. Sometimes the frogs jump away and this direction a lucky direction. This is a prayer for peace and a good harvest in the coming year and one of the seven wonders at the Suwa shrine. In Sakabe, part of Tenryu Village near the Suwa Shrine, and in other villages relating to the shrine. It used to be held on the last month of the lunar year, but now on January 4. People from each village go to the River Tenryuugawa　天竜川 to get pure water and bring it to the shrine in the hills near the village. It is a ritual of "boiling water divination" (yudate 湯立て). The hot water is scattered over the participants to purify them. Afterwards, a fest is held, sometimes ritual dancing and other performances. is the name for the local female deity of the Suwa lake and Mount Moriya　守屋山. She is resident in the Suwa Maemiya Shrine　諏訪前宮神社. It is an ancient cult of Mother Earth. She is probably an old form of a snake worshipped and shows herself as a white snake. Or identical with 建御名方神 or 洩矢神（モレヤ神）. This deity is also known in other regions where matagi hunters roam the forests. 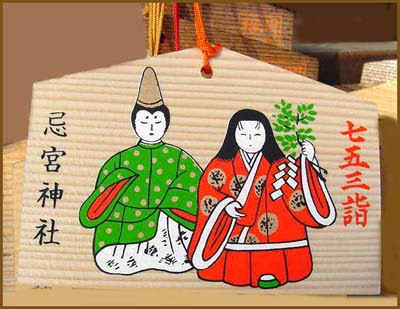 Once upon a time, there were a goddess named Yasakatome-no Mikoto (八坂刀売命) and a god, Takeminakata-no Mikoto (建御名方命). When the Goddess alone moved to the Lower Shrine, the God missed her so much but found that Lake Suwa was too large to cross. Then, when Lake Suwa was frozen over, he took the chance and walked over the ice to her shrine. Today his footsteps are said to be Omiwatari. (This natural phenomenon is said to be caused as water expands with freezing in winter. The straight line of the sharp upheaval appears on the surface, and is called Omiwatari.) People used to regard Omiwatari as the sign which insured safety on the ice. When it came, they would step on Lake Suwa. A rice-planting festival held on July 30th. The rice planted in the festival ripens in 60 days according to the old legend. A ritual performed at Tsutsugayuden (筒粥殿: lit. 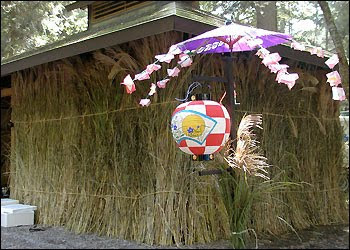 the hall in which to cook the porridge in reed straws) in Haru Shrine. On the evening of January 14th. , rice and azuki-beans are cooked in a pot , into which a bunch of 42 reed straws are put .The next morning ,they perform auguries by the amount of porridge and azuki-beans trapped in the reed straws and “Divination never fails to be true”. Legend has it that the company of an unclean person in the public bath, Watanoyu (綿の湯), makes the hot spring water from the spout cloudy. The fabled tall cedar called Otakara gi (お宝木: lit. the treasure tree) on the premises of Aki Shrine. It is still told to this day that the cedar falls asleep with its branches 10 cm lowered in the middle of the night, when its snoring can be heard. An island on the Togawa (砥川: River To), which runs through the rear of the Haru Shrine. On the island is Ukishima sha (浮島社: a small shrine on Ukishima) Legend credits the island with the ability of surviving any floodwaters. Akenoumi 開けの海　means the lake does not freeze and there is no omiwatari in a year. This happened in February 21, 2009, just before the ceremony before Yatsurugi Shrine 八剣神社 in Suwa City, Nagano Prefecture.
. WKD : Kobayashi Issa 小林一茶 in Edo . This hokku is from the 7th month (August) of 1821. Issa went to the large Suwa Shinto Shrine to see the Misayama Festival, held from 7/26 to 7/30, which was accompanied by sumo contests and many other events. On 7/27 (August 24th in 1821) priests and a group of believers go up the low mountain and build a hut walled and thatched with miscanthus, a kind of reed growing to 5-7 feet high, with striking tufts on the top. There they commune with the gods of the shrine and pray. Meanwhile the Misayama Shrine at the foot of the mountain distributes special chopsticks from the still green stalks of miscanthus reeds to believers, who then eat special rice with the chopsticks. People later take these reed chopsticks home and put them beside bowls of rice that they place in small shrines in their homes to the Suwa Shrine gods, who are believed to bring good harvests. Issa has received a pair of these chopsticks, and even before he eats with them and thereby symbolically shares his rice with the gods, the sight of the green stalks used as chopsticks makes him feel cooler on this probably hot early autumn day. The breeze seems to remind Issa of his experience at the Suwa Shrine, and the timeless time of the gods descends on him again for a few moments, cooling and refreshing him. This hokku suggests loneliness because being cut to serve as part of a wall or the roof in the reed hut -- called the Tufted Hut -- into which gods descend on Misayama Mountain during the Misayama Festival was considered a great honor. The stalks that remain are therefore those that have been passed over and were unable to take part. Now, left behind, the dry, tufted reeds stand amid a snow flurry, accentuating with their astringent straightness the swirling of the flakes. Some dictionaries give "Japanese pampas grass" for susuki reeds, but strictly speaking they are miscanthus reeds (Miscanthus sinensis). A look at Wiki photos will show that miscanthus is slightly slimmer than pampas grass and its tufts more like soft tassels than the long plumes of the pampas grass, with can suggest spearheads. Here is a photo of chopsticks made from miscanthus reeds. The stalks are still green, but in late autumn they turn completely light brown. This hokku was written in the 4th month (May) of 1824. Issa's diary says he visited the local Suwa Shinto shrine on 4/15, so the hokku may be based on what he saw there. 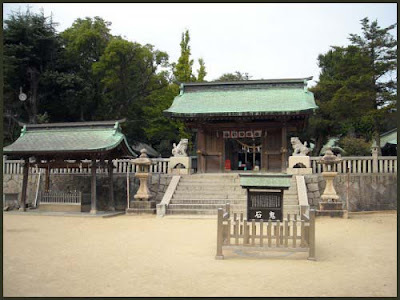 The Sino-Japanese word shadan (社壇) means a sacred building at a Shinto shrine, so the stag in the hokku seems to have shed his old antlers right in front of a hall of worship at a rural shrine near some woods inhabited by deer. 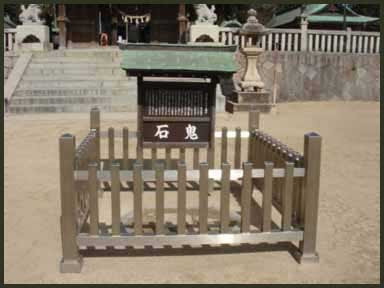 Some Shinto shrines, including the Kashima Shrine, visited by Issa several years earlier, have sacred deer living on their precincts, but the shrine in this hokku seems to be an ordinary Shinto shrine. I take the image to be of a set of antlers left earlier near the steps or entrance to the shrine main building dedicated to the shrine's god or gods, since it seems unlikely the stag is shedding his antlers in front of many people. Deer hunting was widespread in mountainous Shinano, where Issa is living, so the stag would be putting himself in danger if he appeared in broad daylight in an area visited by many humans, even if hunters couldn't hunt within the precincts of the shrine. Issa obviously feels that the stag had some sort of awareness that the shrine was a sacred place and that his placement of his antlers is the result of that awareness, whatever the exact nature of that awareness is. Although Issa attributes certain feelings to the stag, this hokku doesn't seem to be based on strong personification. It simply points to the location of the antlers as a sign that the stag instinctively wanted to offer something that once had great importance in a place that seemed peaceful and spiritual. In Shinto many gods are depicted as riding on stags or using stags as their assistants, so the fallen antlers would probably be treated with great respect and care by the shrine priests. over the lake of Suwa. In former times, on a moonlit night, when the lake showed white waves, this was called "a rabbit is running" 兎が走る.
. WKD : The Hare (Rabbit) in the Moon . The great shrine Suwa Taisha Kamisha (Upper Suwa Shrine) 諏訪神社上社 issued special amulet-permits and the chopsticks to eat "meat from the mountains", which took away the "spiritual pollution" when eating meat. chopsticks to eat "mountain meat"
snow festival at Niino . This shrine was built in the Kamakura period. From its hill there is a good view to Mount Fujisan. Autumn is the season of harvest. City festivals, which were originally traditions and ceremonies used to thank for the year's harvest, will be held in various towns. Enjoy autumn festival with singing and dancing. at Hana no Iwaya Shrine in Kumano-shi. at Kosai-ji Temple (also known as Darumadera Temple), Suzuka-shi. memorial service for "Daruma tumbler dolls" that were used for making wishes last year and whose wishes were granted in 2005 is held. at Mishioden Shrine, Futami-cho, Ise-shi. and goddesses at the Grand Shrine of Ise. (Abalone Festival) around Wagu gyoko. Festival) at Riverside Chakura, Matsusakashi. Oct. 12 BASHOSAI at Ueno Park, Iga-shi. at Toba Shimin-no-mori Park, Toba-shi. Oct. 15 SEKIFUNE MATSURI at Kihokucho. are offered to the Great Sun Goddess. Yokkaichi. 10:00 A.M. - 4:00 P.M.
sacred songs and music will be performed. Kiwa Kaiyo Center, Kiwa-cho, Kumano-shi. 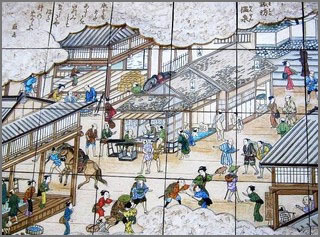 the Edo Period), various events are held. Geku, the Grand Shrine of Ise, Ise-shi. Local speciality products and foods are sold. Sacred dances and music are also performed. School and Riverside Chakura, Iinan-cho. unique to Japan for its name, "kobe"
during the season of entrance examinations. sardine will have a good catch this year. Ground, Tado Taisha Shrine, Kuwana-shi. Hall Parking lot, Aoyama-shisho Iga-shi.